Newburyport City Hall is located at 60 Pleasant Street, Newburyport, MA 01950; phone: 978-465-4400. Photo: Caleb Cushing House, ca. 1808, 98 High Street, Newburyport, MA. Listed on the National Register of Historic Places in 1990. Photographed by User:Daderot (own work), 2005, [cc-by-3.0 (creativecommons.org/licenses/by/3.0)], via Wikimedia Commons, accessed September, 2017. 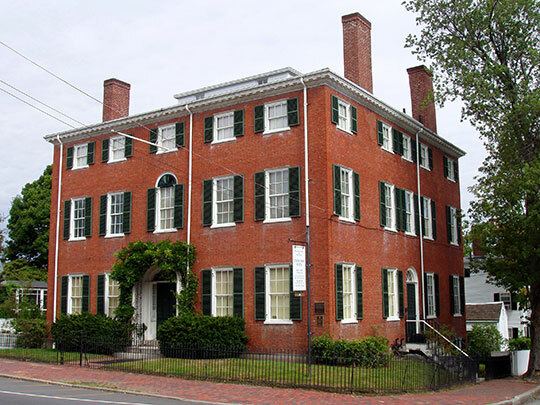 Originally settled around 1635 as part of "Newberry Plantation," Newburyport was designated a town in 1764; at that time the town had about 350 residences with a population of about 2,800. Newburyport was incorporated as a city in 1851.